Michael Chapman has got a big history, he’s been making records since 1969 and used to play the scene with Mick Ronson when they both lived in Hull around then. He’s had some very cool collaborations, travels and tributes by the likes of Lucinda Williams, Bert Jansch, Maddy Prior and Thurston Moore. His latest collaboration with platinum selling Israeli fusion guitarist Ehud Banai is as comfortable as it is unlikely. Rich and I went to see them play at a candlelit New Adelphi Club last night. Both played their trademark solo songs and then as a duo played a fusion of Yorkshire Hebrew mix up songs, starting with Michael’s seminal Soulful Lady. As Michael said, ‘Psychedelia is alive and well in De Grey Street, Hull’. We came across Michael Chapman again because we both have tracks on the just released Fairview Studio 50th anniversary album. John Spence invited 12 bands/musicians who have a longstanding relationship with the studio to record a track exclusively for the album. When I was in Red Guitars and The Planet Wilson we recorded at Fairview – our favourite studio – many times, including the first Red Guitars album Slow to Fade. Loudhailer Electric Company were delighted to be involved – we recorded our funky spoken word number Underneath the Underground as part of Fairview at 50. The album is a fabulous listen and Michael Chapman’s track is gorgeous, a superb new recording of his song about leaving Hull, Shuffleboat River Farewell. 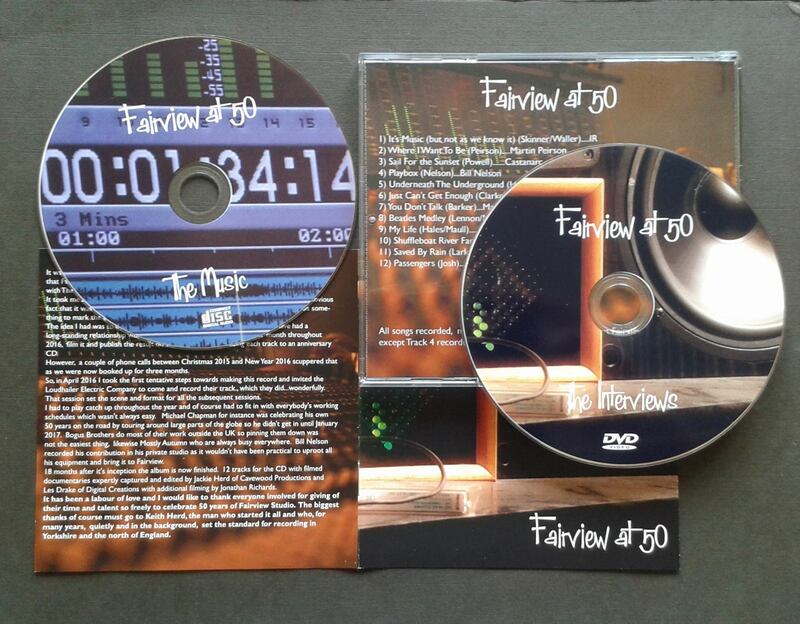 Fairview Studio’s 50th anniversary CD/DVD, just released with 12 exclusive tracks recorded especially for the album. Every track cuts the mustard – Michael Chapman’s Shuffleboat River Farewell is a corker and Bill Nelson’s Playbox showcases his distinctive guitar style perfectly to name just two. The album flows along and a host of videos of anecdotes and chat from all the artists makes it a great package. Look out for it! Just before you go…have a listen to a clip of our track, Underneath the Underground. Thanks to Charlotte Pugh for the fab original psychedelic art work.